Having a lawn can be great – it offers a place to relax with friends, a safe space for the kids to play, and even somewhere for the dog to run around and burn off energy! But, it’s important to remember that lawns need maintenance, and exactly what kind of maintenance they require changes with the seasons. There are also warm-season grasses and cold-season grasses, and the attention needed during any given season can vary depending on which kind is growing in your yard. Below are some tips that you can employ to help keep your lawn beautiful and healthy all year round. If you have a warm-season grass on your property, winter can signal a period of reduced growth for your lawn. Cold-season grasses may fair better, but will still experience a reduction in the speed of growth. If you experience frost in your area, spray-on frost protection can be used to help shield your lawn. Ensuring you remove any leaves that may have fallen during autumn from the lawn will mean the grass can be exposed to as much sun as possible during this time. Cutting back trees that may cause shadows over the grass can also help it receive more sunlight and grow better. You shouldn’t need to mow often during the winter, but when you do, considering changing from mulching to catching the clippings to prevent fungal problems that may arise from the excess grass staying on the lawn. Spring is the season of new life and new growth, and it’s the perfect time to get some good lawn habits down to ensure it’s well-prepared and in great shape for the upcoming summer heat. 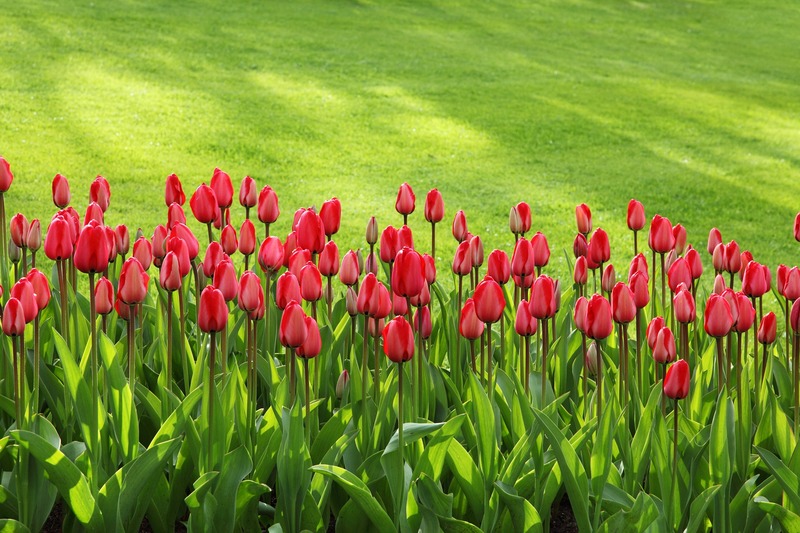 Spring is the ideal time to fertilize your lawn. A slow-release feed might be your best option for ensuring lawn health through summer. Once you know what kind of grass your lawn is, it can be a good idea to check with your local nursery or lawn specialist regarding what kind of fertilizer and methods would be best for it. This season is also the perfect time for repairing your lawn if it needs it. If there are bare patches, consider re-seeding them, and if there is excess thatch, now is a great time for scarifying to encourage new green growth! If you don’t have access to a machine for scarifying your lawn, you can use a rake to dig up the brown grass, or even a lawn mower (there are many tutorials online that can guide you through the lawn mower method for scarifying). Depending on where you live, you may see an increase or decrease in lawn growth times during the summer months. In areas where summer storms are common, the grass will grow quicker, while places affected by drought may experience browning lawns and a decline in grass growth. If you have cold-season grass on your property, it is important to remember not to fertilize it once the weather begins to heat up (85 degrees Fahrenheit and above). This is because, during hotter months, grasses which are designed for cooler weather are under stress, and adding fertilizer that stimulates growth can cause more stress for the lawn. If you have a warm-season grass, then fertilizing in the summer is okay, although it may not be needed as growth may already be very fast during this season. If your area is not under drought restrictions, try to water grass in the early morning, rather than at night. Watering at night during hot seasons can lead to fungal problems caused by excess humidity. It may seem obvious, but don’t mow a lawn if you are experiencing a drought. This leads to further stress for the lawn. If you need to mow, do it after rainfall, and remember not to cut it too short! While weeds probably aren’t too much of an issue for your lawn during autumn, it’s a great season to stop pesky bindis weeds from being an issue later down the track! The real growth of bindis begins in autumn when the plant sprouts soft and green. Use this time to remove them before they end up leaving nasty prickles in your feet in the summer! Go weeding after rainfall when the soil is looser to ensure an easier time of pulling the plants free. Autumn can also be a great time to fertilize your lawn in preparation for winter. The best fertilizer to choose during this time is one that will provide strength for the grass to healthily make it through the colder months. Also, during this season, your climate zone could experience an increase in rainfall, so make sure to mow the lawn accordingly, remove any fallen leaves to avoid fungi development and make sure you’re not watering your lawn too much. Having a beautiful lawn takes an effort to maintain, but with a little time and work, you can ensure you keep your lawn healthy and happy throughout each season. About The Author: Theodora is a passionate blogger from Sydney and she is someone you would call an IT nerd. Also, she takes great interest in psychology and helping people deal with their mental and anxiety issues. Besides that, she loves martial arts and making houses beautiful. Follow her on Facebook or Twitter.